The state of Caribbean bookings is key to the industry right now, given the recent hurricane season and ensuing slowdown in sales for September and October. Reports are mixed, but in general, retailers surveyed by Cruise Week reported a marked increase in volume of sales to the Caribbean in November and the first week of December, versus prior months and, in some cases, year over year. Reports from national sellers are far more upbeat than those from agents focused on locally sourced business. However, both types of agencies agree on one thing: there appears to be a lot of inventory still up for grabs in January and February. Countering that challenge, numerous national retailers report they are seeing more close-in bookings than normal to fill this space, albeit at lower yields to the lines than previously. 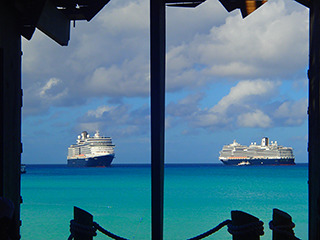 Retailers are also observing rich booking perks for cruises departing early in the year. In general, such pricing strategies are protecting commissions, due to the nature of value-adds. As one retailer put it: "Q1 seems to still be a little squishy, but that is due to timing, and we are seeing more last-minute bookings than normal to fill this space at lower yields. With the exception of Q1 Caribbean, all yields tend to be up." The focus on filling space for winter departures is taking away some of the focus that would normally be placed on developing summer business at this point. That said, no one is panicking about summer sailings. True, several lines appear to be struggling a bit for summer Caribbean in terms of year-over-year volume as of December. Adding to that concern is Caribbean capacity increases for this summer, with the new MSC Seaside and its 4,134 lower beds, Princess going year-round on Caribbean Princess, etc. As of yet, the lines aren't budging on price or value-adds, since they're still focused on filling winter and early spring. Business for March and April is now booking better, retailers say, and the expectation is a strong Wave will lead to solid summer Caribbean business. Agents are citing more intense advertising by lines as driving greater consumer awareness in prep for Wave, and they expect summer business will come pouring in starting in January, based on the type and level of consumer contact they are having now. But they caution that it's still early.